Heat oven to 375°F. Spray cookie sheet with cooking spray. In large bowl, mix ham, broccoli, cheese, mushrooms, mayonnaise and mustard. If using crescent rolls: Unroll both cans of dough into 2 large rectangles. Place dough with long sides together on cookie sheet, forming 15x12-inch rectangle. Press edges and perforations to seal. If using dough sheets: Unroll both cans of dough into 2 large rectangles. Place dough with long sides together on cookie sheet, forming 15x12-inch rectangle. Press edges together to seal. 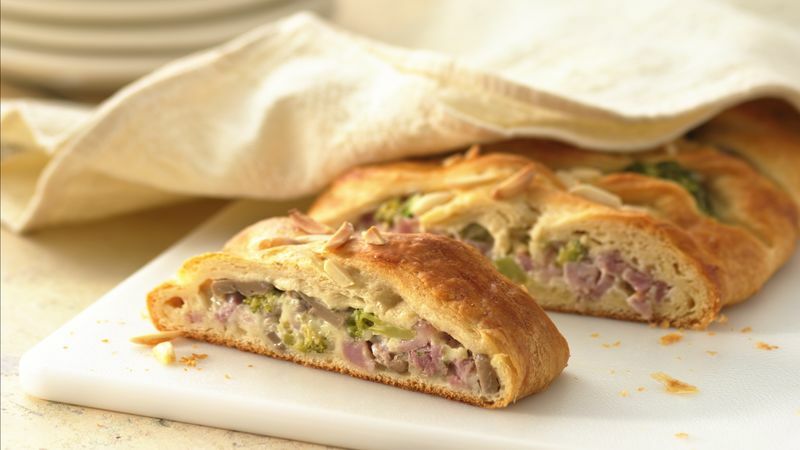 Spoon and spread ham mixture lengthwise in 6-inch-wide strip down center of dough. With scissors or sharp knife, make cuts 1 1/2 inches apart on long sides of dough to within 1/2 inch of filling. Twisting each strip once, alternately cross strips over filling. Tuck short ends under; press to seal. Brush dough with beaten egg white. Sprinkle with almonds. Bake 28 to 33 minutes or until deep golden brown. Cool 5 minutes. Cut crosswise into slices. If using Pillsbury® Big & Flaky large refrigerated crescent dinner rolls, make as directed--except form into 16x14-inch rectangle.